Excellent white cut-flower mixes well in bouquets. Cream petals brighten to white and surround a honey-colored center on this unique new sunflower. Excellent cut-flower variety is pollenless, with one 3-5” bloom per plant on strong, sturdy stems. See how easy it is to grow these summertime favorites. Sunflowers are grown from seed sown directly in the garden after frost. When choosing a site consider that sunflowers need a well-drained soil. They face the sun, so make sure they are in an open area of the garden. The taller varieties will cast shadows on other plants, so plant these at the north end of your garden. Sow seeds ½ inch deep in groups of 2 or 3 seeds. Space the groups 18-24 inches apart, depending on the variety. Thin to one plant per group when seedlings have two sets of leaves. Once established sunflowers can tolerate drought. No fertilizer is needed unless the soil is poor. Do not over fertilize. Some varieties only produce one bloom so once the bloom is spent, the plant may be removed. 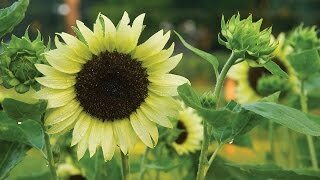 Edible sunflowers will mature in about 3 months or more after sowing. To harvest the seeds, cut the heads off after the stalks are quite dry but before fall or winter rains come. Check the flower heads for maturity to see if the florets in the center of the flower disk have shriveled and the back of the flower head is turning yellow, or the head is starting to droop. Cut flower-heads with a foot of the stalk attached. Hang heads in a warm, dry, well-ventilated place so the seeds may fully ripen and dry. Cheesecloth, netting or a paper bag with holes punched in for ventilation should be placed over the head to protect the seeds and to collect those that may drop from drying. Shorter varieties may be grown in containers. Be sure to use a commercial potting mix. Pollenless varieties make terrific cut flowers.